This glass and steel edifice and sculptural spirals that look like a hyper-modern gallery space or a building from a science-fiction film is, in fact, the MyZeil Shopping Mall, the work of celebrated architect Massimiliano Fuksas in Frankfurt, Germany. Its spectacular steel and glass façade, particularly the vortex, is the conspicuous feature that draws in potential shoppers and sets it apart as iconic. The Zeil in Frankfurt am Main has been one of Germany’s best known shopping streets for more than 100 years. The MyZeil Mall comes in as well suited addition to the richly esteemed shopping district. The value it has added to its immediate context is befitting and redefines what exactly a shopping district entails. It is a strong example of how shopping centres are being reshaped, not just in Germany but around the world. ‘The mall isn’t a space which is apart from culture and the city any more. It’s at the heart of the modern urban consumer and cultural experience,’ says Lucy Knockton, founder of Concierge de Mode, a boutique travel concierge and fashion service that works throughout Germany and in other countries in Europe. Now, to explain the three most distinct marvels unique to the mall, first starting with its envelope. 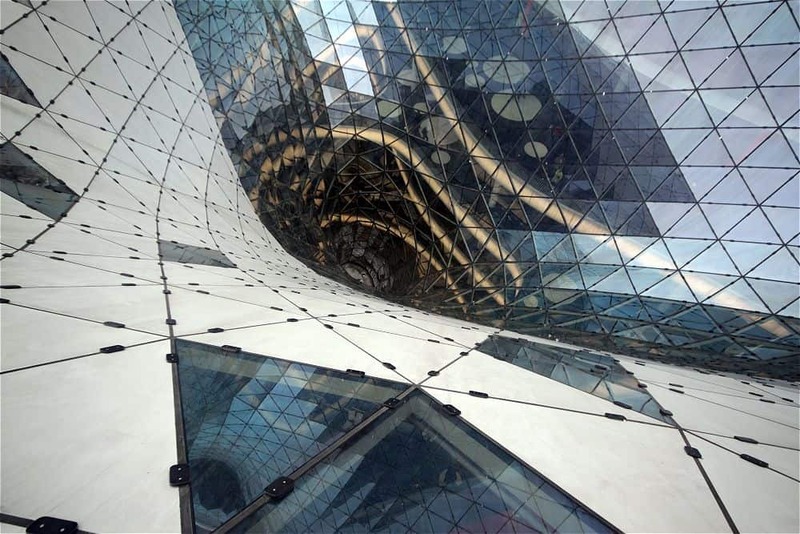 Massimiliano Fuksas designed a glass structure that is curved and partially rotated along its axis, extending in all directions from the 13,000 square metre roof. He says that this design was inspired by a canyon. The glass-metal elements run through the entire building like a river bed, thereby flooding it with daylight. One would wonder where the rock formations of a canyon come in if the building is the river bed, but if the architect says so, then it is so! In his defense, I think the fluid shape of the mall does bring out the river bed concept with indefinite depth and even a swale represented by the trumpet-like void. Speaking of fluidity, the interior fluid shaped spaces offer interesting view relations at all levels of the building. The daylight penetrates into the lower floors and creates a daylight-lit ambience. Fuksas’ glass frontage challenges the distinction between exterior and interior spaces, making the interiors appear infinite. It is not just about the sunlight, for the trasparency also does brings a sense of the outside to the inside. 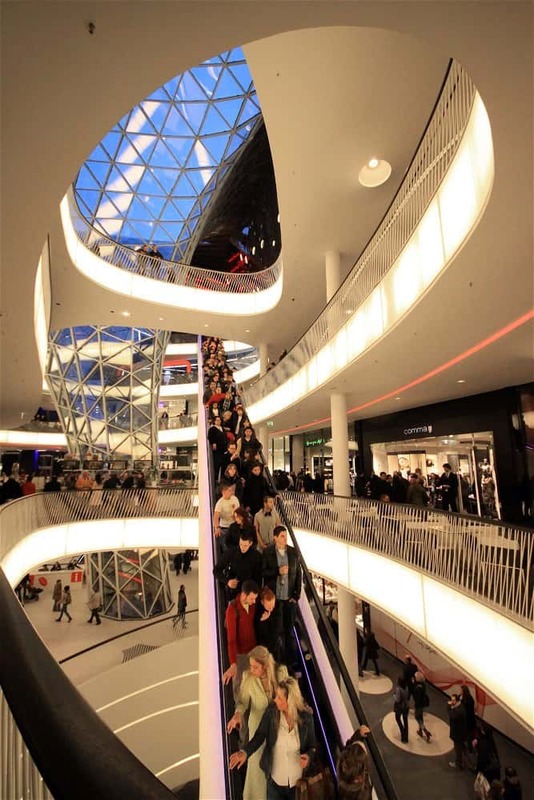 Secondly, MyZeil mall boasts of the longest internal, self-supporting escalator in Germany. Truthfully speaking, judging by the dexterity of the Germans, if its the longest internal self-supporting escalator in Germany, its definitely the longest in the world. The third and most unique feature on this building is the fact that it looks like it has a vortex in its glass facade. It is incorporated into the design in such an interesting manner. The fully glazed main facade continues the organically formed steel-glass roof and allows the pedestrians a view through the building into the sky by an inward trumpet formed deformation, the perceived vortex. It starts from the elevation of the facade, goes through the main hall and forms itself finally in the ground floor as a well-lit tunnel. The void appeares to pulled into the atrium of the mall as though being sucked by a futuristic space creature. The glass curves appear to create a vortex, a somewhat witty play on the idea of a mall as an empty, soulless and superficial space with all the things that are fashioned to keep your wallet empty. Apart from the fancy form, Fuksas also provided elaborate spaces fit for such a public building. Inside the impressive façade are 77,000 square metres housing shops, restaurants, a fitness centre and leisure spaces. Around 1400 parking lots are available to visitors beneath the building in the town’s largest underground car park. The two facades on opposite ends of the building are designed to evoke the two distinct senses of the city. The curved modern city on the facade running along the Zeil expresses leisure, entertainment and relaxation. The historic-facing facade, though glazed too, maintains a formal rectilinear appearance. The MyZeil Shopping mall is a clear indication that architecture has become part of the shopping experience and the feeling is one of luxury. In this centuury, the mall is no longer just a building to go pick and pay for what you can afford but to experience and appreciate the treatment of the public space, as well as interact with and interrogate the space.